Most people today are very deficient in most of the fat soluble vitamins (A, D, E and K2) and would benefit greatly from the healthy dose that a couple of egg yolks a day can bring. In fact, egg yolks will keep the doctor away much more than the fructose-rich apples will. The cholesterol in them is also much needed, especially for children, menopausal women, elders or anybody with adrenal problems. On their parts, egg whites are not such a big deal and can even cause problems for some people. Appreciate that tasty super-food without guilt and discard the white without loosing anything meaningful if you suspect that that make you feel bad. All hail to the egg yolk omelet! 1) Eggs are one of the most versatile foods on the market. What other ingredient can cause a souffle to rise and a custard to thicken? What else can be scrambled, fried, poached, and baked – with equally delicious results? Eggs are just as handy when separated. Egg whites make delicate meringues and elegant angel food cakes, while egg yolks enrich sauces, cakes, and pie fillings. 2) Eggs have a high nutrient density because, in proportion to their calorie count. 3) Speaking of protein, egg protein quality is so high that scientists often use eggs as the standard by which the protein quality of other foods is measured. 4) Did you say “lean”? As for the fat found in eggs, two-thirds of it is the healthy unsaturated kind. 6) Any time of the day is right for eggs. 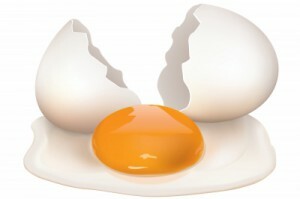 7) Egg yolk is an excellent source of choline, a nutrient now considered essential for human health. 8) Lutein and zeaxanthin are two newly-recognized nutrients that have put eggs in the “functional foods” category. A functional food is one that provides health benefits beyond its basic nutrient content. 9) On weekends, when time is not an issue, eggs can be elegant. 11) Children like eggs, too! 12) Convinced yet? Why not try out new egg ideas with your family?